I was lucky enough to be selected for not only one, but two tutorial exchanges through Totally Tutorials last month. I took you on my duct tape adventure last week, so now it’s time to share my fun with fabric. 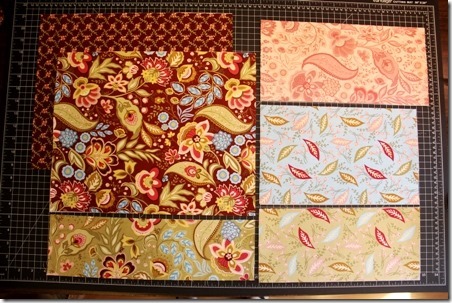 I received this pretty bundle, called Sophie, from Clothworks. It just so happened that my mother-in-law was getting a shiny new hip last month, so she would be spending some time recovering. One of her daughters bought her a Kindle so she could read during her downtime, but I noticed it didn’t have a good storage spot of its own when she wasn’t using it. 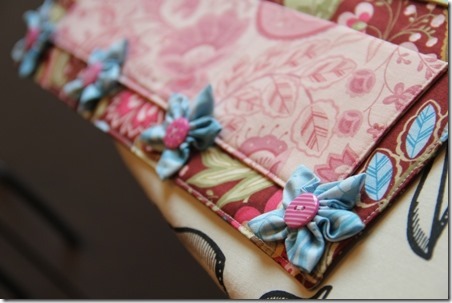 She has a rocking chair where she sits to read and relax, so I decided to make an organizer to hang on the arm. You’ll also need four grommets. I used 7/16”. If you haven’t used them before, you’ll want to buy the kit that includes the tools to apply them. It’s usually only a couple of dollars more. Iron the interfacing to the back of each fabric piece except the ties. Sew one long edge of the two body pieces to either side of the top piece with right sides together. Press the seams. Fold right sides together and stitch the sides and bottom using a 1/4” seam (as we will throughout), leaving 4” open at the bottom. Turn right side out through the opening. Press, turning in the opening even with the rest of the seam. Stitch around 1/8” from the edge. Stitch on either side of seam between top and body. Fold each pocket with right sides together. Stitch around each, leaving 2” open. Turn right side out and press, pressing in opening. Place bottom pocket on the body, 1” from the bottom and each side. Pin in place. 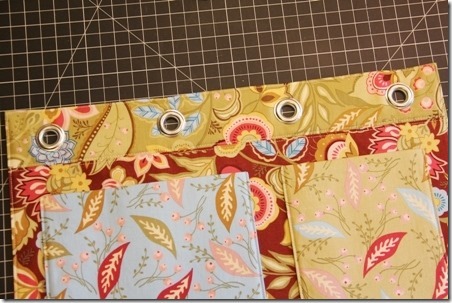 Place left and right pockets 1” above bottom pocket and 1” from each side. Stitch down sides and across bottoms of all three pockets. Stitch vertically down bottom pocket 5” from the right and again 1” away from that to create 3 openings. The little one in the center is great for holding a pen. To apply the grommets, mark four equally spaced spots at the top. 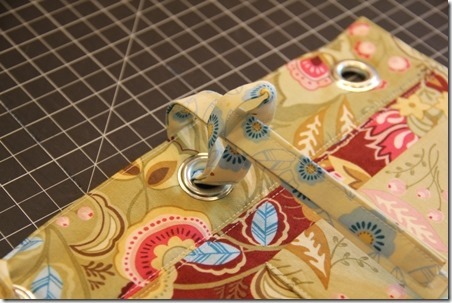 Hold a grommet in each spot and trace around the inside. Cut out the inside of that circle through all the layers. Insert the grommet from the front. Flip it over, put the anvil underneath, the top of the grommet over the part sticking up and the setting tool on top. Hammer away some frustration until the grommet is set. Repeat with the other three. 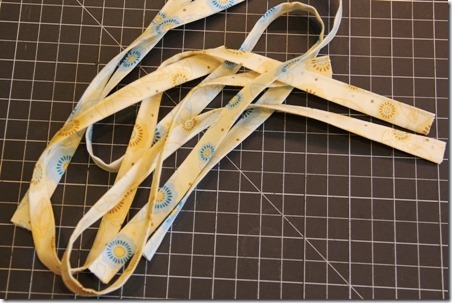 To make the ties, fold the short ends on each piece to the inside 1/2” and press. Fold in half the long way and press again. Stitch close to the edge opposite the fold. Thread the ties through the grommets by pushing a loop from the back and feeding the ends through. It was a little plainer than I wanted, so I added four flowers across the bottom, using my Forever Fabric Flowers tutorial and starting with 2” squares. Her Kindle and television remote fit nicely. I realized after it was finished, it would be perfect for tying to the front of her walker. This would also make a great gift for a new mom to attach to her rocker in the nursery. Thanks again to Totally Tutorials and Clothworks for giving me the opportunity to work with these lovely fabrics!